Median facial clefts (Tessier number 0) are rare congenital anomalies. Median cleft lip is defined as any congenital vertical cleft through the center of the upper lip. The incidence of median cleft lip varies from 0.43% to 0.73% in cleft lip population and is estimated to occur in one in 1,000,000 births in general population. Patients are classically categorized as having either hypertelorism or hypotelorism. Anatomical anomalies including midline diastema (midline space between the maxillary central incisors) have been described. The associated diastema presents with submucosal alveolar bone defects and mesial tipping of maxillary incisors. Due to the absence of the alveolar bone in this particular region, this defect cannot be corrected by conventional orthodontic treatment. Midline cleft lip defects appear to occur when medial nasal prominence derivatives are deficient or absent. The aim of this study was to evaluate the incidence and management of median cleft lip occurring in cleft lip and palate patients of Central India at our institute. 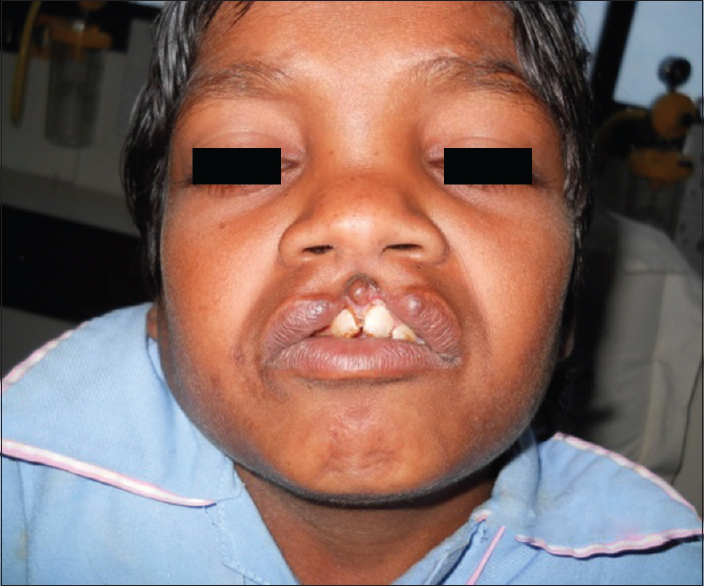 A 10-year-old boy with poor socioeconomic status reported to our unit with deformed upper lip. The child was first the issue of full-term normal vaginal delivery. On examination, the child displayed a midline cleft of the upper lip and philtrum with widening of the base of the columella. The cleft was found to be extending to the alveolus with notching. Hypertelorism and flattening of the nose with wide ala were also present. The movements of the soft palate were normal. There was a tipping of the maxillary central incisors as well. There was no previous family history of any craniofacial anomalies. The antenatal history was not significant with no exposure to any viral infection, drugs, alcohol, or radiation. There were no associated cardiovascular, gastrointestinal, or genitourinary system anomalies. Systemic examination and routine blood investigation were within normal limits. The boy had achieved expected mental and physical milestones commensurate with his age [Figure 1]. The marking of the cleft edges was done in an inverted “V” fashion. The philtral base was marked to be of 8 mm and a columellar base 6 mm. The incisions were marked to a point 2 mm above the vermilion border lateral to the defect, which were then carried medially. Incisions were made as per the markings. The orbicularis oris was dissected anteriorly and posteriorly from the skin and mucosa to the lateral margin of alar base. The abnormal muscular insertions at the nostril sill and alar margins were released. Closure was then completed in straight line fashion beginning with the labial sulcus. Sutures of 4–0 vicryl were used to repair the muscle. Special emphasis was given to evert the vermilion to create a midline pout. Skin closure was completed with 6–0 nylon. The postoperative period was uneventful. Sutures were removed on the 5th day with good cosmetic result [Figure 2]. The rareness of median cleft lip and the wide spectrum of abnormalities observed result in the absence of a common surgical technique suitable for all patients. Various techniques such as Francesconi triangular flap technique, Pinto and Goleria's modified Z-plasty, and inverted “V” excision technique depending on the merit of the cases have been described. Lengthening of the upper lip is achieved by increasing the length of the incision from lip vermilion border to columellar base at the expense of transverse lip length; alternatively, a Z-incision may be added. Creation of a proper midline lip tubercle is important and needs adequate eversion of the vermilion. Each case needs to be carefully assessed with individualization of surgical technique. The developmental error that results in midline facial defects usually occurs during the 3rd week in gestation. At this time, bilateral thickening of the frontonasal process occurs. These thickenings of the surface ectoderm become the medial and lateral nasal prominences that contribute to the formation of the nasal philtrum and upper lip. Fusion of the globular processes is responsible for formation of the anterior portion of the hard palate, the central dentoalveolar ridge, and the central upper lip and philtrum. It is essential that fusion of these prominences occurs for normal development of the upper lip. Furthermore, because of the interrelationship between the developing face and forebrain, midline cleft, especially when the premaxilla is absent, may indicate a sequence of associated facial and cerebral anomalies (the face predicts the brain – Demyer et al., 1964). Since there is a close relationship between the cells of the neural crest and the closing neural tube, defects in these frontonasal process derivatives can lead to severe brain malformations. 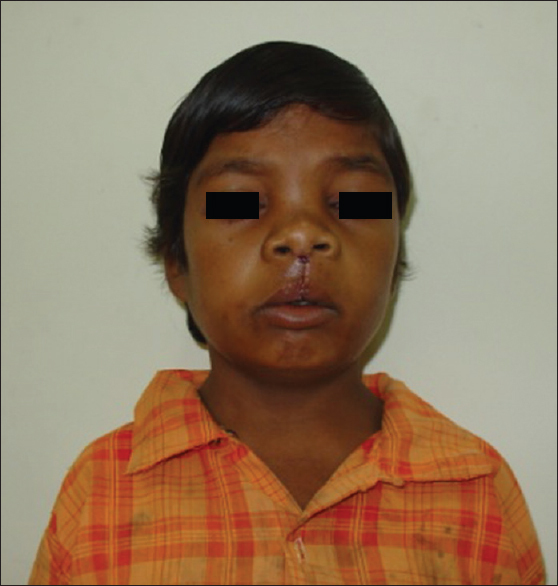 Our case report represents the median facial cleft. The patient presented with typical features of median cleft lip, mild alveolar notching, flattening of nose, and widened ala with hypertelorism. Other deformities which may also be present with median facial cleft category are V-shaped frontal hairline (widow's peak), cranium bifidum occultum, telecanthus, and median cleft nose and palate. Despite the anomalies, these patients frequently have normal intelligence. Often, agenesis of the corpus callosum may be seen which is sometimes associated with seizures but is usually asymptomatic. Median cleft lip is usually divided into true and false when being discussed. Owing to recent developments of diagnostic imaging methods that have improved the accuracy, the presence of an intermediate type of median cleft lip, which cannot simply be divided into true and false, has been suggested. However, the simple method of classification is still clinically valuable; the upper labial frenum can be found in true median cleft lip, whereas no upper labial frenum is found in false median cleft lip. The shape of the upper labial frenum may be a factor that can be used for clinically classifying intermediate median cleft lip into either true or false in cases that are otherwise difficult to classify. Patients falling into the first group (DeMyer sequence) generally have bad prognosis. These rare deformities may be genetically transmitted as autosomal dominant or recessive traits. With the presence of family history of median facial dysmorphias, the possibility of recurrence in a subsequent child is as high as 50%. Total agenesis of the premaxilla is frequently associated with a lobar holoprosencephaly or failure of cleavage of the prosencephalon. These patients are severely mentally retarded, and their life expectancy is correspondingly short. Reconstruction is therefore not indicated in such patients. We report a rare case of median cleft lip. Craniofacial cleft repair is a complex surgery, and diagnosis of defect should always be made with respect to the morphology of the defect before the treatment. In cases of true median cleft lip, re-approximation of orbicularis oris muscle is a key to reconstruction regardless of surgical technique used. Wiemer DR, Hardy SB, Spira M. Anatomical findings in median cleft of upper lip. Plast Reconstr Surg 1978;62:866-9. Bishara SE. Management of diastemas in orthodontics. Am J Orthod 1972;61:55-63. Sadove AM, Eppley BL, DeMyer W. Single stage repair of the median cleft lip deformity in holoprosencephaly. J Craniomaxillofac Surg 1989;17:363-6. DeMyer W. The median cleft face syndrome. Differential diagnosis of cranium bifidum occultum, hypertelorism, and median cleft nose, lip, and palate. Neurology 1967;17:961-71. Liao HT, Chen CH, Bergeron L, Ko EW, Chen PK, Chen YR, et al. Alveolar bone grafting in the treatment of midline alveolar cleft and diastema in incomplete median cleft lip. Int J Oral Maxillofac Surg 2008;37:886-91. Johnston MC, Sulik KK. Some abnormal patterns of development in the craniofacial region. Birth Defects 1979;15:23-42. Francesconi G. Bifid nose. Median dysraphia of face. In: Mustarde JC, editor. Plastic Surgery in Infancy and Childhood. Edinburgh: Livingstone; 1971. Pinto CJ, Goleria KS. The median cleft lip. In: Hueston JT, editor. Transactions of the 5th International Congress of Plastic and Reconstructive Surgery. Australia: Bulterwaths; 1971. Lynn RB, Buchanan DC, Fenichel GM, Freemon FR. Agenesis of the corpus callosum. Arch Neurol 1980;37:444-5. Jaramillo C, Brandt SK, Jorgenson RJ. Autosomal dominant inheritance of the DeMyer sequence. J Craniofac Genet Dev Biol 1988;8:199-204.